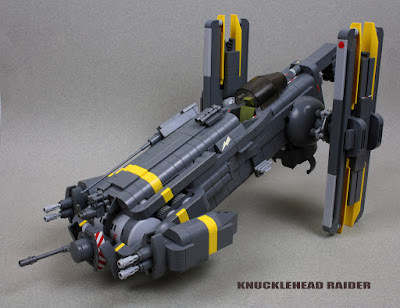 This amazing spaceship Knucklehead Raider is built and shared by flickr.ocm member ska2d2. This fighter has rotating engines and a cool looking dark gray-yellow color-scheme. The texturing is also done very well. I also liked the cockpit section. The windshield is placed backwards and can be opened by sliding back. The creators photo stream is full of great sci-fi MOCs so don't forget to check them out.